It is ideal that you find a regular car service provider that can offer a well-structured plan which can predict your car’s needs even before they become problematic. As you can imagine, the market includes a wide variety of options and it is up to you to find the best fit for your car and your personal needs. We have created this ultimate guide precisely because you may need some help finding the best possible service provider amongst all the alternatives. You need to know why it is important to find a comprehensive servicing plan and how it can actually improve your vehicle. It is up to you to identify the key points that you want it to include so that you can take care of your car on your own terms. What is Bosch Car Service? Why choose Bosch Car Service? Regular car servicing is essential for expanding your car’s lifespan, as well as your own safety. You need to make sure that your car is in proper shape and that it is adequately equipped for environmental conditions. This will ensure that you have a safe journey every time you get in the driver’s seat. Your car needs more than the regular petrol-fill and the occasional oil change. And it is up to you to make sure it is properly taken care of so that you don’t end up on the side of the road looking for car tolling companies. Cars are meant to be resilient and dependable, but for them to reach these standards, it is crucial that they are well taken care of. Changing your vehicle’s oil is one of the most important things that you will need to do. 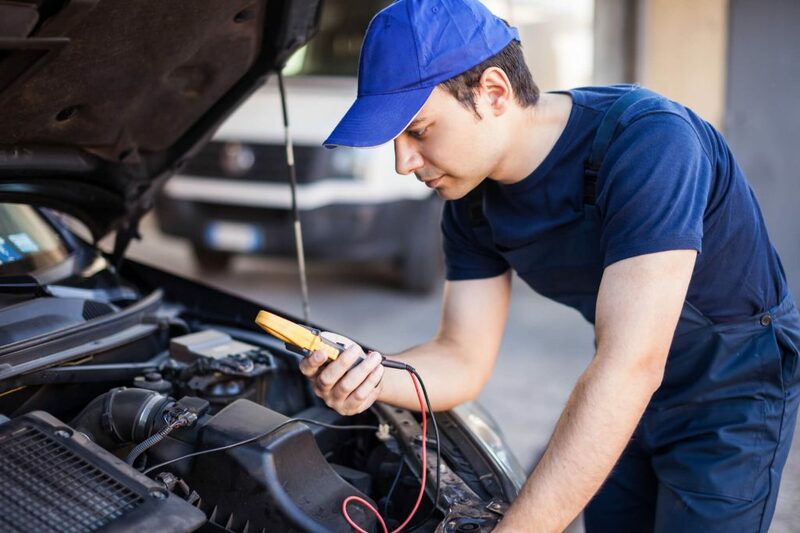 Your mechanic can advise you when and how this needs to be done, according to the particular conditions your car runs in, such as climate, road quality, frequency of driving, and engine type. 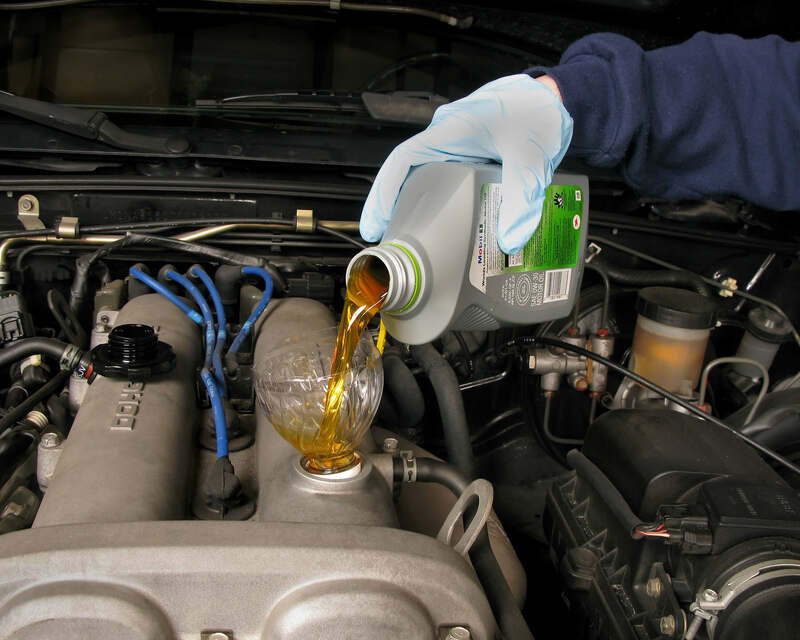 If you do not change the oil at the proper time, you are essentially reducing the lifespan of your engine. In time, the oil you put in your car undergoes thermal breakdown and it becomes less and less effective as a lubricant. This will make parts of your engine rub together and actively wear themselves out. Moreover, the oil is also meant to absorb combustion by-products, dust, and water. It will hold them in suspension so that they cannot affect the engine parts. However, the oil can only do this efficiently for so long and if you do not change it on time, your engine will become susceptible to corrosion. Aside from oil, there are many other essential parts of the car that need to be managed periodically so that your car can run smoothly for longer. This is precisely why your best choice is a long-term car service provider. This way, your mechanic can establish a plan that includes all of these essential maintenance activities. We strongly advise that you have your car battery checked periodically because you might miss the subtle signs of battery failure and find yourself trying aimlessly to start your car. After long cold winters, hot summers, or prolonged periods of time when the car hasn’t been used, the battery might begin to wear out. It is all too easy to fail to notice that your interior lights and headlights are dimmer than usual or that the reason why some of your car accessories are not working properly is the fact that your battery is failing. While the normal lifespan of a car battery is three years, there are many factors that can reduce this period drastically. Tyre maintenance involves more than switching to winter tyres when the temperature drops below 0. Your tyres are subjected to continuous wear and tear due to road irregularities, climate, and driving patterns. Your mechanic will evaluate the current state of your tyres every single time you come in so that you don’t find yourself with a flat tyre. The current state of your braking system is extremely important for your safety and that of the people you encounter in traffic. The breaks are some of the most used parts of your car. This is why your mechanic will inspect the state of your pads, drums, brake disks, shoes, brake hardware, and parking breaks to make sure that everything is running smoothly. The aim of the air filter is to provide proper air flow to your engine and restrict the passage of airborne contaminants that could damage it. Having your filter replaced periodically will ensure that your engine runs properly and that its lifespan is prolonged significantly. Aside from high-quality car oil and clean air filters, your engine needs to be protected from overheating, as well as freeze. While your mechanic will provide you with a maintenance plan, make sure that you take you take your car in for an evaluation before long journeys or carrying heavy loads because you might need additional cooling gear installed. A suitable long-term servicing plan will keep your car working properly, which means that you can depend on it when you take it out on the road. In the event of an accident, the state of your breaks, your tyres, or your engine could make the difference between life and death. This is why it is essential that you are able to depend on your car. Driving a new car is fantastic because you get to feel the full potential of the vehicle. A proper long-term servicing plan will keep your car running like new for a long time. This way, you can enjoy your car for longer and have a better driving experience every single time. As engines get more and more used, they require a larger and larger amount of petrol. One of the advantages of preserving your engine’s health is the fact that it keeps the gas levels it needs to a minimum and this will save you money every time you fill up your tank. Moreover, a car service programme will save you money on the long term as well. Keeping your car in tip-top shape will actively reduce the odds of your car ever needing comprehensive interventions, which are usually excruciatingly expensive. When it comes to car service programmes, the world is your oyster because there are plenty of options to choose from. In fact, the amount of companies offering this type of service could prove to be rather overwhelming. Let us tell you a bit about the three main places where you could get a long-term car service plan. Every new car comes with a certain warranty period during which the dealers ensure that your car runs smoothly. This means that your car will be provided with a long-term maintenance programme. Depending on the type of contract you have signed with the dealer, you need to make sure that the programme they provide includes all the key features mentioned above. It is essential that your car is properly taken care of from the very beginning because it will always run best with its original parts. Preserving them is very important, so you must make sure that the car service programme provided by your dealer is complete. You can opt for a comprehensive one when signing the contract or you can create an alternative maintenance programme with another company approved by the dealers so as to stay in line with the terms of the warranty. After your car’s warranty is complete, you can either prolong it or talk to your dealer about a long-term car service plan at their garages. However, people often find the plans offered by dealers to be overpriced, so make sure you explore your options before you make your choice. This is actually one of the most debated options because each independent garage provides its own type of services. It is extremely difficult to generalise about small garages are independently owned and the quality of their services differs greatly from one to another. As such, some of these places might have excellent mechanics as well as affordable prices while others might offer less than satisfactory services at unreasonable rates. We strongly advise that you read customer reviews or go to a place recommended by a trustworthy acquaintance to make sure that you reach one of the good ones. 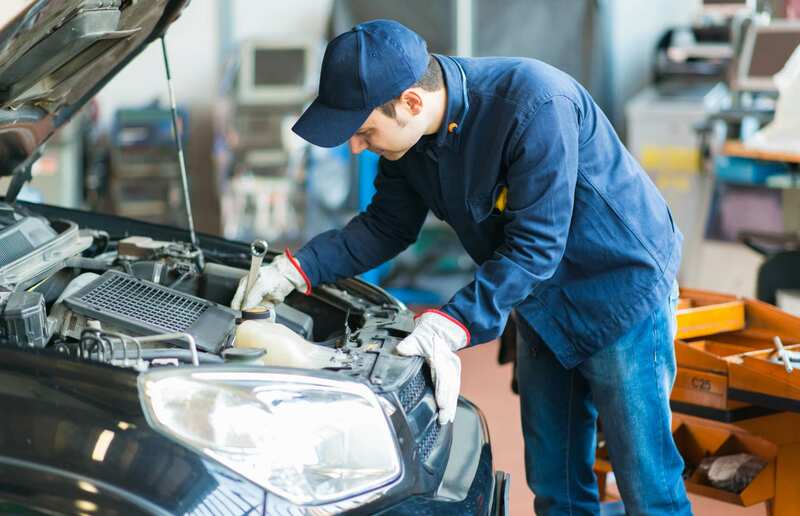 While small independent garages imply the risk mentioned above, car service companies can ensure a more reliable standard of quality for their services which makes them a much safer option. Moreover, they might be able to offer more complex maintenance plans at more reasonable prices than both dealers and smaller garages. Bosch Car Service is one of the best options currently available on the market because they offer vehicle maintenance plans, as well as diagnostics and repair services at excellent rates. Their services are provided by highly trained mechanics and they are available for all car brands. Bosch Car Service features a vast network of independent garages spanned all across the world. The quality of the services provided by each of these is guaranteed by the Bosch brands, which has a longstanding reputation for excellence. 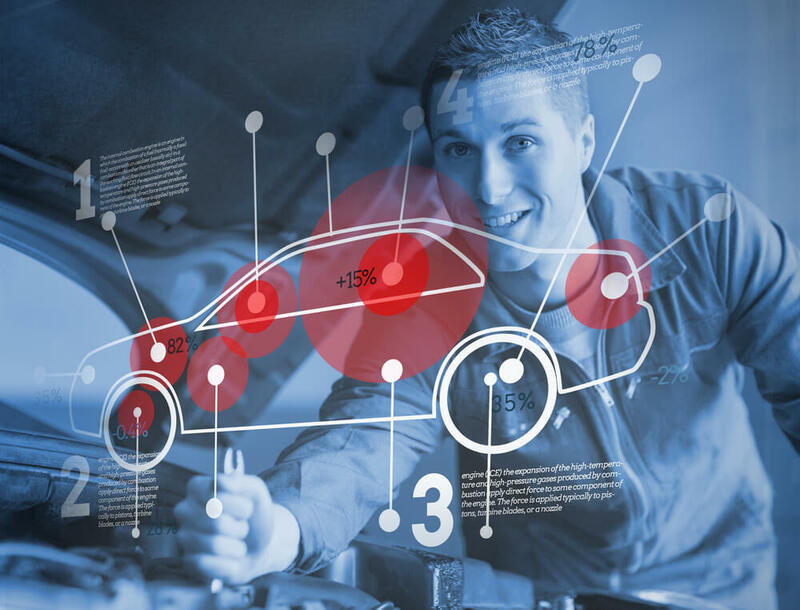 The main advantages provided by the company are the wide range of services they offer and the fact that they will work on any car, regardless of brand or production year. Bosch Car Service garages meet all of the requirements of the ideal service provider. They have an impressive garage network that covers Europe, America, Australia, and Africa. Clients can use the garage-finder feature from their website to find all the available options in their area. Bosch technicians are trained to work with the latest technologies. Member garages are assessed periodically by Bosch. They are required to undergo quality and performance checks to assure that brand’s standard is well represented. Their service points include up-to-date diagnostic equipment which can detect a car’s issues efficiently and accurately. They offer first class services for cars of any brand and model, which makes them one of the most accessible service providers on the market. Another reason why so many people choose Bosch is their affordable prices and the wide variety of operations included in their offer plan. Bosch Car Service is one of the warranty-friendly garages, which makes them an ideal option for services that are included in the warranty plan. The company assures that all the parts which will be replaced will be of the same quality as the original ones, so as to ensure that the car’s plan is not affected. Bosch is committed to providing its customers with the best possible experience at their garages. All of their service points abide by the Bosch Car Service Code of Practice, which ensures that any one of the members will offer first class services. The MOT (Ministry of Transport) test is the mandatory annual vehicle safety and roadworthiness test that every British car older than three years needs to undergo, under current law. Bosch Car Services is the ideal place where British drivers can bring their cars for assessment because the test will be conducted by highly trained specialists with authorised equipment. 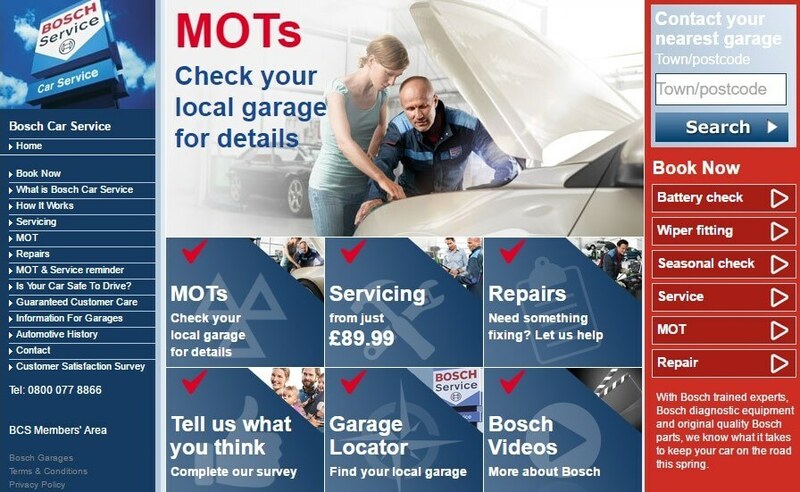 Car owners can book their place for the MOT assessment with Bosch on the company’s official website. In just a few clicks, they can find the best possible garages for their needs and set up an appointment. Bosch Car Services offers a vast range of repair services for cars of any brand and model. Customers can book appointments online and read about the specific areas they cover. They are required to fill in their vehicle registration number, as well as the details of their fault. This area covers the periodic check-ups that are recommended when the car reaches a certain mileage quota. According to their specific driving patterns, customers can opt for a service pack that best suits their needs. Seasonal checks are very important because they ensure that the car is properly equipped for the climatic changes of the new season. Car owners can book appointments online to have their winter/summer tyres put in, as well as any additional modifications they may require. Independent car service providers and car dealers have long been competing in the service market. At the moment, car owners are able to opt for the ideal service plan for their needs. Bosch Service is one of the best options when it comes to independent garages because they provide first class service assured by the company’s brand reputation that is compatible with warranty plans. However, a complete service plan may require both dealers and independent garages. While dealers offer warranty plans, it is up to car owners to choose the provider of the additional services according to their own criteria. Car dealers are widely known for having high prices for services provided outside warranty plans. As such, many car owners have been struggling to find complete car maintenance packs that are in line with their warranties. The new competition rules for agreements between car manufacturers and dealers, repairers, and auxiliary car parts distributors established by the European Commission are meant to increase the competition in the vehicle market. These new guidelines will give way to independent garages to enlarge their service areas by gaining access to the technical information required for certain operations. 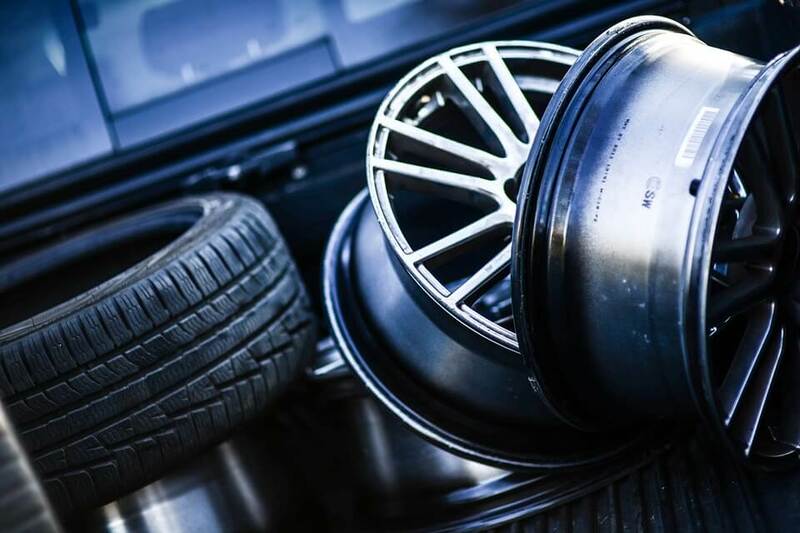 Moreover, these rules are meant to facilitate the use of alternative spare parts, which can increase the array of car service providers that can perform the operations included in warranty plans. This makes Bosch Car Service an excellent option because they offer affordable prices for their repair services, as well as attractive maintenance packs. Bosch Car Services puts great emphasis on the quality of the customer service provided in their locations. All the garages authorised by the company provide services in line with the Bosch Car Service Code of Practice. While dealers are also known for offering superior customer service, Bosch is guaranteed to offer a pleasant experience every time. Car dealers provide their services in authorised garages and finding one in your area could prove to be rather complicated at times. Bosch Car Services has an extensive garage network meant to improve this issue and increase service accessibility. Car owners can find the most convenient location by using the garage locator tool available on the Bosch official website. They are required to enter their postcode or desired location and they will be provided with the complete list of available garages in their area. 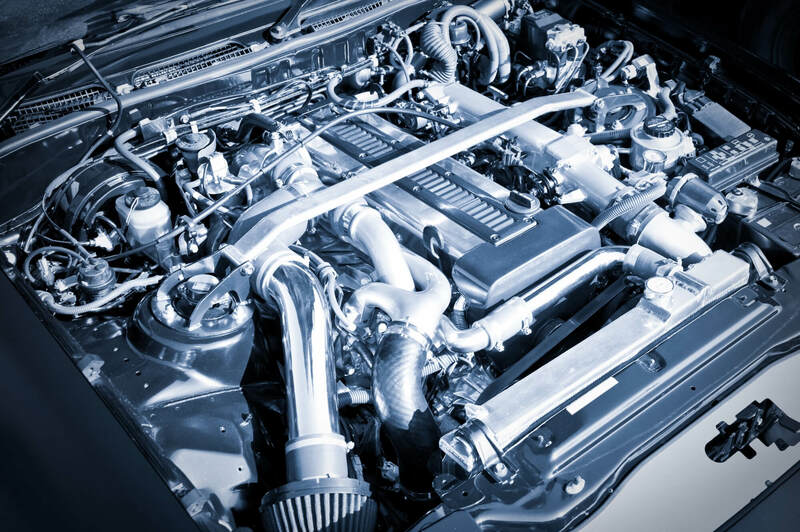 Car dealers pride themselves on having expert mechanics specialised in the technology of certain car brands. This has been the main advantage they have had on independent garages for many years. However, due to new regulations, access to brand-specific technology information has been increased and mechanics can enlarge their area of expertise. Bosch Car Service enforces a strict testing process for its employees aimed to guarantee that their mechanics are in line with the highest professional standards. As such, car owners can know that they will get first class service in anyone of the company’s locations. Ultimately, establishing the ideal long-term plan for your car depends on your specific needs, expectations, and budget. Whether you choose an independent garage like Bosch Car Service or you set up a plan with your car dealer, the important aspect remains that you gain access to proper car maintenance so that you stay safe and enjoy your car for longer.